Challenge your players with monsters fearsome and cunning from the Fantasy AGE: Bestiary! From the savage Afanc to the towering Zenadrim, the awesome adversaries in this book can be used for single encounters or long-term story arcs in your campaign. More than 50 individual monster entries, each with statistics, backgrounds, and adventure seeds. Creatures drawn from urban legend, mythology, and classic fantasy, as well as brand new, never-before-seen monsters! An additional collection of natural and mundane animals, from bats to giant squid! Variations for nearly all the monsters allow you to create hundreds of new creatures. Additional options and information on further modifying and customizing monstrous challenges. Over 30 special qualities you can use to customise existing monsters and adversaries. Want a Flying Feral Troll, or Giant-Sized Clockwork Bears? This book has what you need. Monsters compatible with Blue Rose, Titansgrave, and other games and settings powered by the Adventure Game Engine. 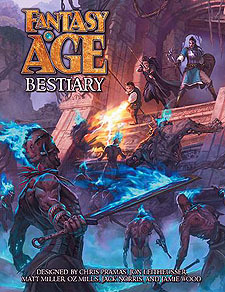 The Fantasy AGE: Bestiary is the AGE system GM's best friend, an indispensable resource for any campaign.